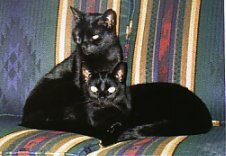 The Healthy Cat Blog lists all the updates to this site. I'll let you know as soon as I add new pages or change anything. I'll also let you know when I find other great resources to keep your cat or kitten healthy and happy. To be sure to keep up-to-date with the latest additions, you'll need to subscribe to the Healthy Cat Blog. To subscribe, take a look at at the box under the navigation bar on the left. You can subscribe through any of the popular RSS providers. If you're not sure what RSS is all about, click on the little question mark next to "Subscribe To This Site" to your left. RSS feeds are a big timesaver and give you easy access to the sites you want to keep up with. Bookmarks are on the way out. When was the last time you checked your bookmarks? 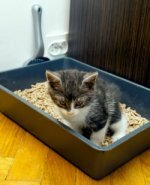 Steps for kitten litter box training your new kitty. Help avoid accidents by diligently setting a routine and being consistent with your kitten. Continue reading "Kitten Litter Box Training Steps"
Cat litter box training steps for successfully house training your adult cat. What you can do to prevent accidents. Discipline is not an effective strategy. Continue reading "Litter Box Training"
Help ease your kitty’s transition to her new home and other pets. Set up a safe place for your cat until she gets used to her new home. Essential supplies for bringing home a new cat. 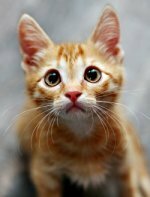 Continue reading "Bringing Home a New Cat or Kitten"
Cat hairballs are a normal and natural cat health issue. In most cases, your cat can take care of the problem herself, but sometimes your cat or kitten will need some help. Continue reading "What are Cat Hairballs, Anyway?" Your cat grooming itself is a natural part of your cat's health. They spend a large majority of their waking hours taking care of this task and they have the best cat grooming tools available. Continue reading "Is Your Cat Grooming Itself Properly?" Have all your cat bath supplies prepared before you start bathing your kitty. Cat grooming. Continue reading "A Cat Bath in Nine Steps"
Program Flea Control for cats effectively interrupts the flea life cycle and helps prevent flea infestation. Continue reading "Program Flea Control"
Organochlorines are flea-killing insecticides that may be dangerous to your cat's health. Long-term side effects may poison your cat. Continue reading "Organochlorines and Your Cat"
Pyrethrins are considered non-toxic insecticides. They are supposed to be safe for your cat, but some cats are allergic to this insecticide and can suffer from side effects. Continue reading "Pyrethrins are considered "non-toxic" flea control"
Rotenone is a toxic chemical used in flea control treatments that can cause serious problems for your cat's health. Flea dips commonly contain this insecticide and should only be done by your vet. Continue reading "Rotenone and Your Healthy Cat"
Organophosphates are responsible for most pet poisonings. They are found in all types of pet products and can be extremely toxic. Watch for symptoms of poisoning in your pet. Continue reading "Organophosphates and Your Cat"
Green Duck Cat Furniture has it all. Extensive selection and quality workmanship for all your cat furniture needs. Continue reading "Green Duck Cat Furniture Review"
PetCareCentral transferred its pet supply stores to Drs. Foster and Smith in May of 2007. Continue reading "PetCareCentral sold to Drs. Foster and Smith"
A flea-free environment keeps your cat healthy. Prevent and eliminate fleas from your cat's environment with safe and natural methods. Continue reading "Maintaining a Flea-Free Environment"
Site Owners: Submit Your Site. 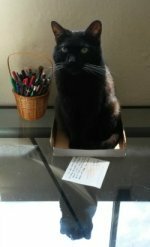 Useful cat and other pet-related sites welcome! Continue reading "Submit Your Site"
If you decide to use a flea exterminator, be sure to ask for references. Research the flea insecticides he plans to use. Ask your veterinarian for recommendations to find a good exterminator. Continue reading "Hiring a Flea Exterminator"
Most animals shelters in the U.S. cannot read the Banfield microchip. A collar and pet ID tag should be worn at all times for extra security. Continue reading "Banfield Microchip Problems"
Which cat toys are best for your cat? Safe and interactive toys keep your cat healthy, happy and entertained. Make your own toys. Continue reading "Safe and interactive cat toys"
Link to Us at MyHealthyCat.com and share with other cat lovers. Continue reading "Link to Us"
PETsMART is a one-stop online pet store with a huge pet supplies inventory. Natural outdoor flea control methods are effective and safe for your cat. These methods are a safe and natural way to help reduce and kill fleas. You don't need to use toxic chemicals in your yard. 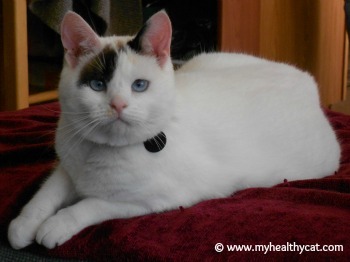 Continue reading "Outdoor Flea Control"
Continue reading "My Healthy Cat Sitemap page 2"